"Heavenly spread for meat, fish, sandwiches, and burgers. They serve this at my favorite Middle Eastern restaurant. Finally got the recipe! 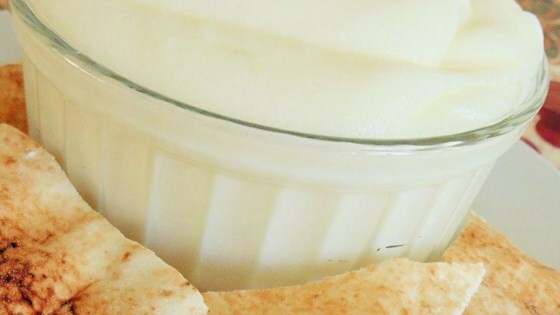 This is heaven as a dip with pita bread, but everyone in your party has to have some. Serious garlic!" Place potatoes into a large pot and cover with salted water; bring to a boil. Reduce heat to medium-low and simmer until tender, 15 to 20 minutes. Drain and transfer to a bowl; mash until smooth. Set aside to cool. Put garlic, salt, and lemon juice in a blender or food processor; pour in enough olive oil to lightly coat garlic cloves. Blend mixture on high; slowly stream remaining olive oil through the top opening of the blender or food processor until mixture is smooth. Add mashed potatoes, about 2 to 3 tablespoons at a time, to the garlic mixture while blender is still running. Continue adding potatoes until all are incorporated. Transfer sauce to a bowl and refrigerate until chilled, 1 hour to overnight. A quick, no-brainer sauce - perfect for pasta and veggies. The garlic sauce was wonderful! Made chicken shawarmas for dinner and they were a hit! The potato ingredient was brilliant! Will use this recipe regularly in the future! Thank you! This is the best & by far the easiest recipe of homemade tomeya ever! It tastes exactly like the one I used to have back home & it's hassle-free. I would give this a hundred stars if I could.